Creating scenes with graphical blocks is the middle ground between Magic scenes and Lua scenes. As with Magic scenes, Block scenes are created visually, however there is no limitation to the number of actions that can be performed once the scene is triggered and to the number of triggers. Each block represents a trigger that will cause the scene to run, or an action that the scene needs to perform. Start by adding a new scene. Select Scenes section from the top menu. Click Add scene button located in the left sidebar. You will be given three scene type choices. In Add scene using graphic blocks section press Add button to start creating a Block Scene. Triggers that will cause the scene to run must be selected. In almost blank box click + button at the beginning. List of trigger types will be displayed. In this example the scene will be triggered by detecting motion. 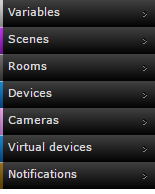 After clicking the + button navigate through section and room selection to find your device, and select it by clicking. Every change of checked trigger state will run the scene. If you want it to act only as a condition, uncheck it. In the green section select the Breached status. Or – to add another trigger (any of the triggers will start the scene). You can add any number of triggers. It is recommended to keep all triggers in the bracket. Yellow logic operator block placed after triggers allows choosing Then operator that ends trigger selection and allows to add acting blocks. Click + button after Then operator block to start selection of acting block. There are few different types of action. In this example after breaching the Motion Sensor the light will be turned on. After clicking the + button navigate through section and room selection to find your device, and select it by clicking. Graphical block representing the acting device will be added. Block is divided into different sections just as triggering device, but green section represents action to be performed by the device. In the green section select the Turn On action. Click Save under the graphical blocks section to save the scene. 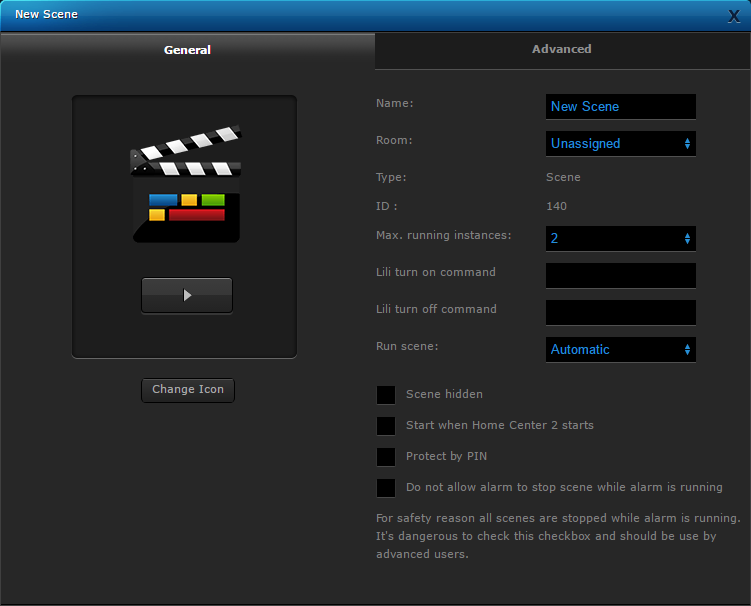 Scene will be added and configuration screen will be displayed allowing to change the scene’s settings. Change the name of your scene to make it recognizable and assign it to a room. Save using the button on the right hand sidebar. ON/OFF slider enables/disables the scene. Clicking the Play button runs the scene.